Spindle Blanks - Large variety of pre-cut sizes for your woodturning projects! pen turning blank: ¾” x ¾”x 5”. When spindle turning, the piece is fixed between the centers of the lathe and the grain is running parallel to its axis. ...and larger items such as finials, balusters, chair legs and stool legs, etc. 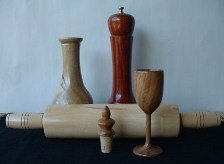 Most of our customers purchase these woodturning blanks in the square size they need but in a length to make several items. 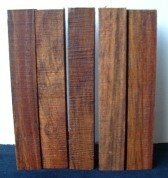 Our blanks are supplied in a variety of turning woods. Our woodturning blanks are green wood unless otherwise stated. They are sealed in wax to slow or prevent drying. Go to Wood Inventory to view description of woods in stock, pricing and inventory. Go to Bowl Blanks to learn about this product. 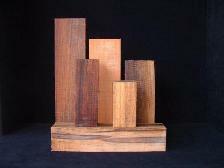 Return from Spindle Blanks to Woodturning Blanks 4 U home page.